As some of you will know, our house is currently in a state of extreme disarray. To the outsider it would look like a troupe of chimps had been housed in it for a month. We are having construction work done that affects all four of our main rooms. All four will need fully redecorating. 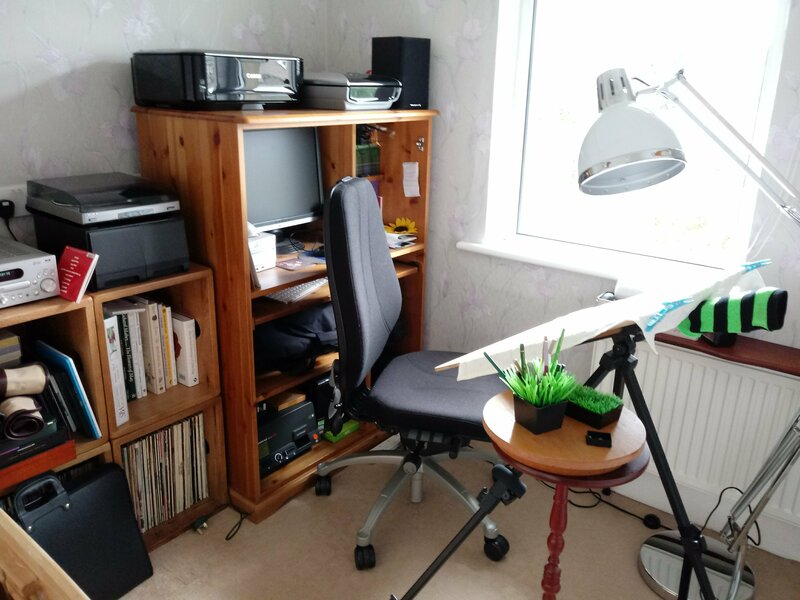 My wife knows I can’t cope with disruption so we made sure that our (unaffected) spare room was converted into an office/drawing studio for me. This means I can hole up in here when I can’t stand looking at the rest of the house. It has one, north-east facing, window which is great for me as it only gets direct sun early mornings in summer. And priority has been given to music too! My IG followers have seen many of these pictures already. I am currently working on a drawing of a white flowered cultivar of the Passion Flower, Passiflora caerulea. Drawing white flowers on white paper is a challenge that often scares artists but I do enjoy it. I always start with the main flowers in a compostion. The first two went on quite easily but placing the third was trickier. Drawing the flower outlines on tracing paper then moving it around to get the best placement is my usual method. At this point I was experimenting with having the whole piece in ‘Portrait’ orientation but decided on ‘landscape’ after taking this picture. Then I started to add leaves and unopened flower buds. I find that Prismacolor Black Grape is good for the first layer beneath greens. Using grey beneath green I find flattens the green layers added afterwards. By using an underlayer of a complementary purplish colour it makes the greens more vibrant later. The greens will be a mix of three Faber-Castell Polychromos colours: Permanent Green Olive, Chromium Green Opaque and Earth Green Yellowish. I have also used Derwent Artists pencils on this piece – their Green Grey was the basis for shading the white parts of the flowers. So, this is the stage I am currently at. I have numerous more leaves to add in Black grape before I add the layers of green on top. Due to redecorating duties I estimate this will take me another 6 weeks. Next Fashioned by Nature – Adventures in Lettering. Your studio is so wonderful! Your work is amazing, I could read these kind of posts and watch your drawing videos for days. This is my favorite drawing of yours. This flower reminds me of a beautiful ballerina. The colors are stunning together. I will be making a note in my sketchbook. Love and hugs my talented friend 💗😍. That composition looks beautiful Darren. It is like looking at music through the image of flowers. Maybe that could be a theme for a series? Flower Music? I loved seeing your work in progress and reading about the technique behind the talent. Do you have videos?! This is so beautiful! It is so interesting to see the stages in your creation. I love the black grape colour with the white and green. Thank you😄. Ah, the videos are out of the closet now… I did record two short videos of me drawing to share with the rest of the WFNC team, partly to say hello in person and so they could hear my voice. Apparently I reminded them of Bob Ross who I had to google as he is not a big name in the UK . If I upgrade my WP plan I might put videos on here. Thank you Ali. Eventually the black grape will be covered by a layer of green on top but you have given me an idea. Maybe I should finish doing the foliage in black grape then photograph/scan it before adding the green to the leaves? I get two images for the price of one. I can’t leave it black grape for the exhibition as it requires botanical accuracy. I can try once I get a break from wallpapering! Ohhh that’s beautiful! I always wondered how you draw thos elovely flowers! Hope the rest of the construction work is relatively painless. The flowers are looking lovely already. Thank you Dominique. Funny thing is that this type of post was the original intention for my blog! I would love for you to have this in your home! I would be so honoured❤. I have a break from decorating now – to cook dinner! You made my day Darren! I’m the one who would be honoured to have your artwork in my home. Not only do you draw beautifully and take gorgeous photos but you can do wallpapering, cooking, gardening, writing… You are a man with many talents! I knew that already, of course. Nice studio! Mine is like hundreds of paintings and drawings everywhere, paint tubes,papers and canvas in piles, quite messy. Amazing drawing! I love such careful and accurately done drawings, yet, I don’t think I have patience for small things. Neat place, attractive work, great post. Thank you my friend😍. I am not even sure it IS humanly possible – it really does a number on the fingers and eyesight! I can imagine. Do you use prisma pencils? A friend of mine draws too and he always says it’s very mental. There can’t be any mistakes as you can’t just erase the oily consistency of the pencils. He applies a lot of pressure and the eyes I’m sure from the concentration are strained as you say. Your friend is right😊. The purple layer is prisma and is impossible to erase if I make a mistake. My touch is very light though, which helps. Derwent artists pencils are a favourite with some botanical artists, and their colour range is great, but I find them impossibly hard – the opposite end of the scale to prisma. Hi Darren, Just letting you know I nominated you for The Versatile Blogger Award. 🙂 No pressure, just letting you know! Much of what you see were bought when I was a teenager scouring junk shops for (then unfashionable) old fifties and sixties albums. There are even some 78rpm Elvis records in there somewhere. I do still play a lot of it and have looked recently at vinyl copies of favourite albums I only have on CD (e.g. Nirvana’s Nevermind). Half of my collection is also from my teenage years, the others are found at vintage shops and replace ones I lost to a leaky roof years ago. I admit I don’t play them much anymore, but it’s still fun to discover an old favorite. It is. I am a huge Beatles fan but oddly this is one band where I only ever play the vinyl and have never bought the CDs. I saw the price of the new remastered white album on vinyl and I went white too! New vinyl is not cheap.